Many American foods have their roots firmly planted in Europe and have developed in this country in a sort of convoluted fashion. The recipes were often brought to our country with immigrants when they migrated here, and usually adapted to utilize ingredients that were readily available. Chowder, for example, had its beginnings in France, then was brought to French Canada before finally evolving into the chowders that are famous to the New England region of our country. The English word chowder, in fact, is said to be derived from the French word chaudière—the pot in which chaudrée, or chowder, is cooked. The root word from which these are based is chaud, French for hot; chaudière translates literally to cooker or heater. And if there were such a thing as a family tree relating to foods, chowder's first cousin once removed would be, in my opinion, Louisiana gumbo. That hearty dish takes its name from the West African word gombo, meaning okra, and seems to be a sort of abstract of a chowder recipe that has evolved with the conglomeration of peoples in Southern Louisiana, including some of the French that fled Eastern Canada to that region. The chaudrée of Northwest France is a sort of fisherman's stew, which consists of seafood of the region simmered in broth along with vegetables and herbs. A listing in the French cookery encyclopedia Larousse Gastronomique translates chaudrée to English simply as "fish soup." It goes on to state the various seafoods that can be included in the dish, including eel! When the French of that area migrated to Canada, not surprisingly, they brought with them their beloved recipes for chaudrée. A 1970 edition of the bi-lingual book Food-À La Canadienne lists two recipes for chaudrée; one is based on fish and the other potato. When some of these French migrated southward, into New England, the language of course was English and chaudière, or chaudrée, began to be pronounced as—and eventually known as—chowder. There, the chowders were based on clams simply because of their regional abundance. 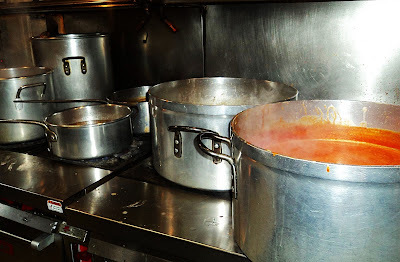 It wasn't until the early 1900's that a creative restaurateur at Coney Island replaced the milk in chowder with tomatoes to create Manhattan Clam Chowder; this was, at the time, a travesty to a New Englander. Chowder today can be based on almost any meat, fish or vegetable, though many purists will probably dispute this. There are a few guidelines that should be followed though. Chowder is usually a rather rustic soup with coarse-chopped ingredients; though it is often thickened naturally, traditional chowder does not contain flour as a thickening agent, but a little flour will give the soup a certain viscosity. Most importantly, the two defining ingredients that denote chowder are diced potato and cured pork, such as salt pork or bacon. 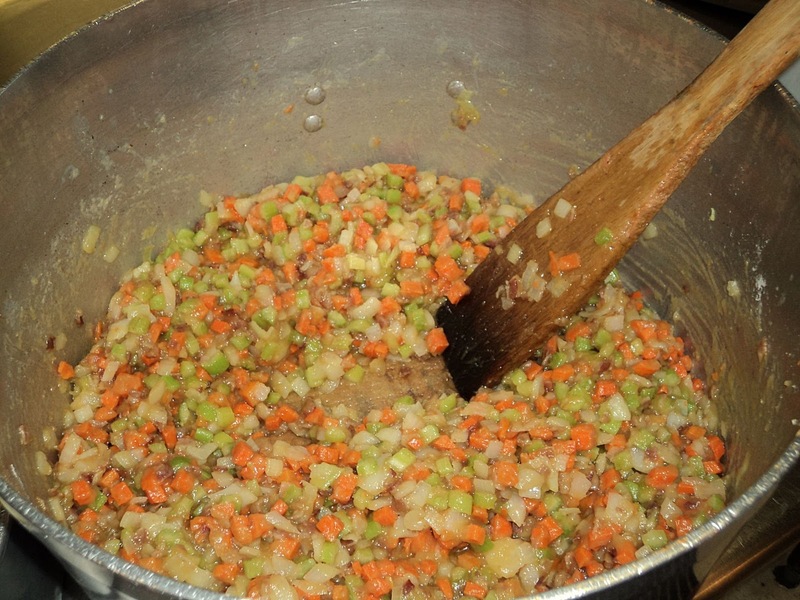 Heat the butter in a large heavy soup pot over medium high heat, when it begins to bubble add the ham, onions, carrots, celery and garlic. Sauté the vegetables and ham for approximately 5 minutes, until they are soft and translucent but not browned. Stir in the potatoes, chicken stock, thyme, salt and black pepper. Bring the soup to a boil then lower the heat to a low simmer; skim any impurities that may have risen to the surface of the soup. Simmer the soup for 45-60 minutes, stirring often. Using a wire whisk, gently break apart some of the potatoes to give the soup some viscosity. If adding the milk, do so directly before serving the soup and do not boil it once the milk has been added. Place the clams in a pot with the water or stock. Cover and steam them for about 10 minutes, or until they are fully cooked and completely open. Strain the broth and reserve it; remove the clams from their shells and discard the shells. Chop the clams and reserve them. In a heavy soup pot over medium heat, sauté the salt pork until it is golden brown, crispy, and all the fat has rendered from it. Add the onion, celery, and carrot; sauté another 2 minutes. Stir in the flour, lower the heat slightly and cook the vegetables and flour for 5 minutes, stirring continuously. Add the potato, thyme, salt and pepper, stir the potatoes to coat them with the fat and flour. Add the clam broth to the pot a little at a time, while stirring, to avoid any lumps. Bring the soup to a boil to a boil and add the chopped clams. Lower the heat, skim any scum that has risen to the surface and simmer the chowder for 15 minutes. Stir in the milk, but do not boil it. If desired, garnish the chowder with a sprinkling of chopped parsley, paprika, and a pat of butter.